Enjoy spring all year long with this quilt. Can you smell their fragrance on a warm day? This pattern was actually inspired by an old Japanese vase. I loved the shape of the flowers, so I put them in this quilt. The finished quilt size is about 28 x 34 inches, give or take a little. 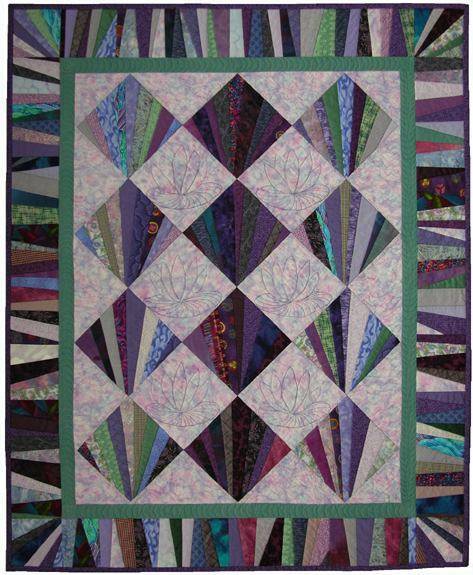 The iris are set inside a fused inner border which is one of Ann's trademark ways to simply and effectively unify a quilt. The background of 6 inch squares is light blue shading to lime green. Of course you may set them on any color you wish, and change the flower colors as well! The leaves are machine appliqued with a decorative stitch, the stems and flower heads are machine embroidered. I have made every effort to give you complete instructions in a small booklet and very large pattern page. This is the second in Ann Fahl's Designer Series	View the completed project. 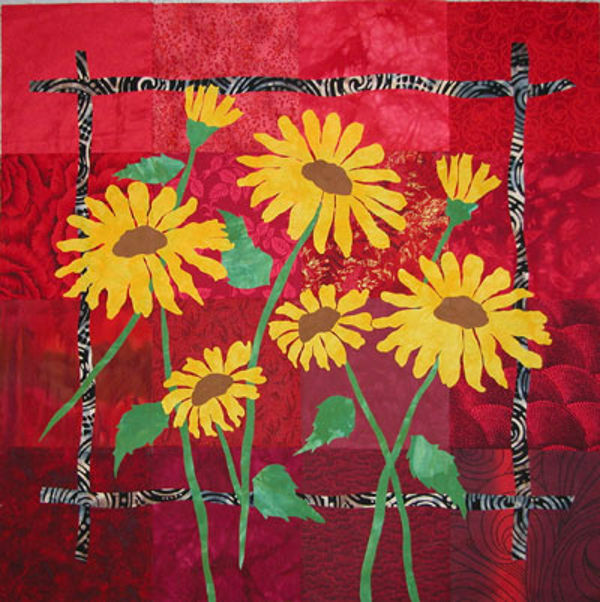 Seven Black Eyed Susans dance across the red patchwork background of this quilt. The flowers are large open blooms to small buds that add variety to the dance. It is framed with an inner fused border which is one of Ann's trademark ways to simply and effectively hold a composition together. Complete directions include how to lay out the background, cut and fuse the garden elements, and provides a choice for machine appliqué or free-motion embroidering the flowers and leaves. The finished quilt is approximately 22.5 inches square and a great way to use up scraps. You can easily personalize this pattern by changing the colors of the flowers and the background. View the completed project. Can you smell the earth on a moist spring day, as little green sprouts begin to emerge? 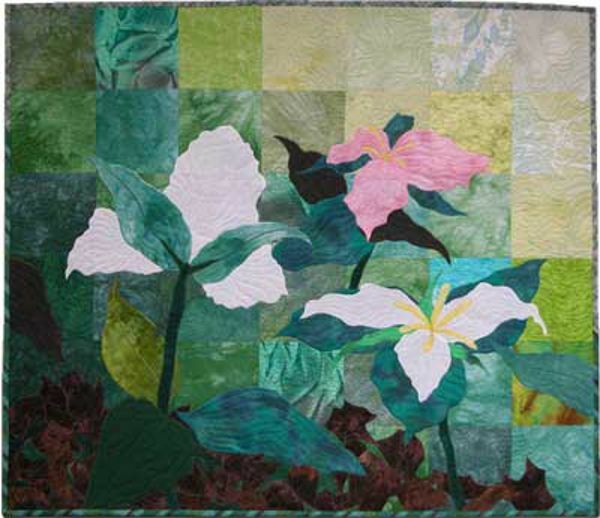 In this pattern, three trillium are growing in the woods. The flowers grow on straight stems, with three petals, sepals and leaves. When they open they are pure white. As the blossom ages, it turns to a soft pink, then eventually curls up and turns brown. 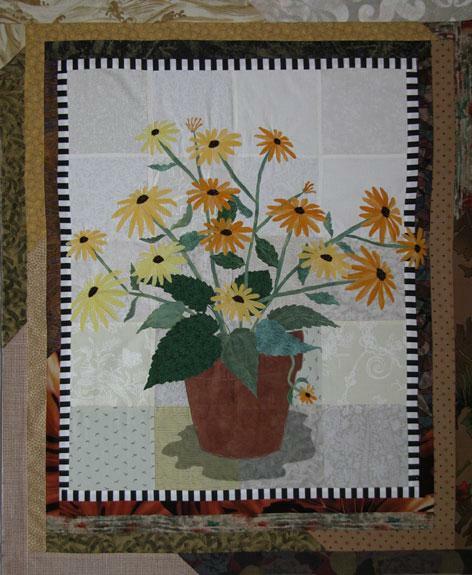 The flowers and leaves are machine appliquéd on a green patchwork background. Finished size is about 38 x 33 inches. This pattern includes flowers in 3 different views and is appropriate for intermediate quilters! View the completed project. 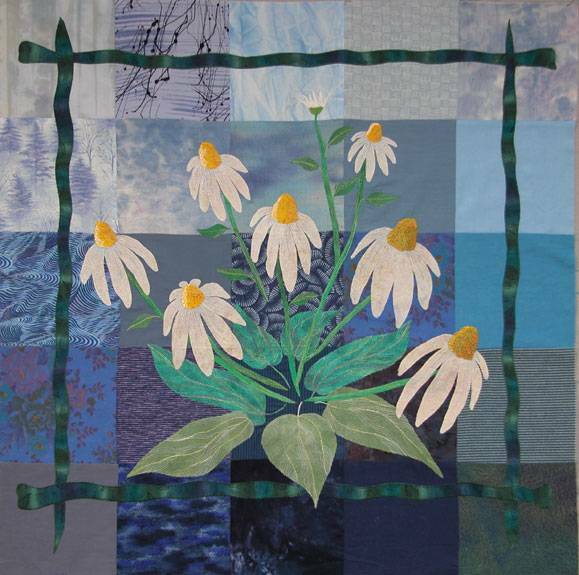 Ann uses leaves as a design element in many of her quilts. 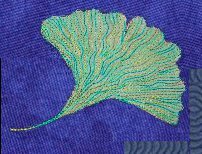 The ginkgo leaf is a favorite because she discovered them in her favorite place, Winona Lake, IN! 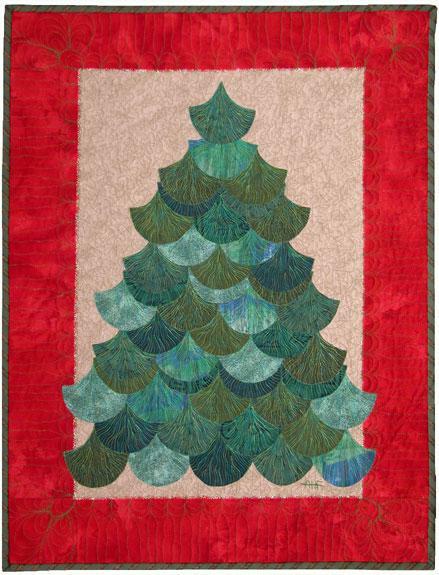 This pattern uses a stylized ginkgo leaf that is fused and arranged in rows to create a realistic Christmas tree, on a plain bordered background. The shapes may be machine appliqued or free-motion embroidered into place. Instructions for each method are included. There are two sizes are included in the pattern bag. Make the 9 x 12 inch quilt for a gift, and keep the larger one, 20 x 26 inches for yourself. View the completed project. This pattern is based on Ann's prize winning quilt of the same name. She loves the way the white flower petals brighten up the dark spots in her garden, and likes to watch butterflies and bees collect food and honey from the large cones. 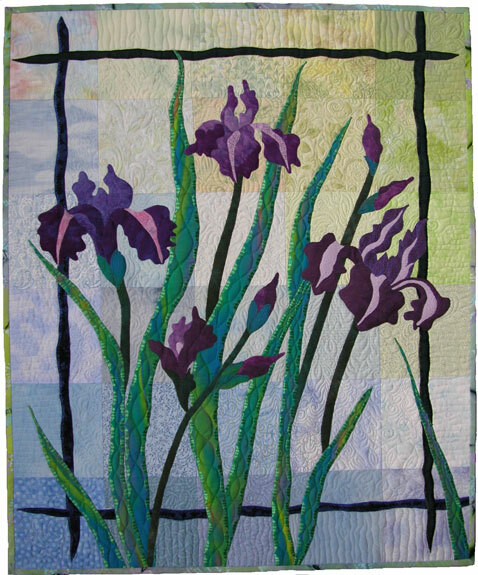 The flowers are fused onto a background of rich blue squares; a curvy fused strip creates an easy inner border to frame the quilt. Complete directions are given for either machine applique' or free-motion embroidery. There are plenty of tips and ideas to embellish this cluster of flowers. The finished top is approximately 28 x 28 inches square	View the completed project. You can almost hear the sounds of the water lapping at the shore, while looking at these peaceful water lilies. The beauty of this flower comes from its simplicity. They were special to me in my childhood years, and have become an important element in my quilts. 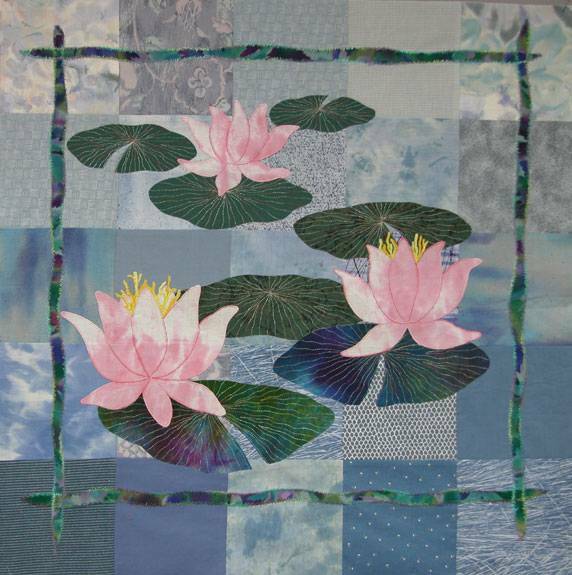 In this pattern, three beautifully detailed lilies float above seven lily pads that are machine appliqued in place. They all rest on a patchwork surface of six inch blue squares with a curvy fused inner border. The finished size is 28" x 28"	View the completed project. Black Eyed Susans or, Rudbeckia, are one of my favorite flowers. They brighten up the shady spots in my garden, and their wonderful golden color lasts longer than any other blossom in my yard. Each spring I give away the new seedlings to friends and strangers. Not only do they bloom all over town, but now they continue to bloom all year in my quilts. 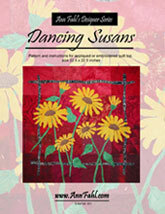 This pattern, 31 x 38 inches, is for quilters that are comfortable using the sewing machine. The flowers are fused onto a pieced background. You may machine (free-motion) embroider them in place or use a satin stitch around the edges of the leaves and flowers. There are instructions for both techniques. The border is applied in "log cabin style" using strips of various fabrics in dark browns. View the completed project. Purple Diamonds can be made using your choice of colors, combining rich tones with pastel fabrics. The finished size of the top is 36 x 44 inches. Twelve blocks, set on point, alternating with plain squares. A double border repeats the pieced design in the enter. The blocks and border are sewn on a lightweight foundation using strips cut in a variety of widths. 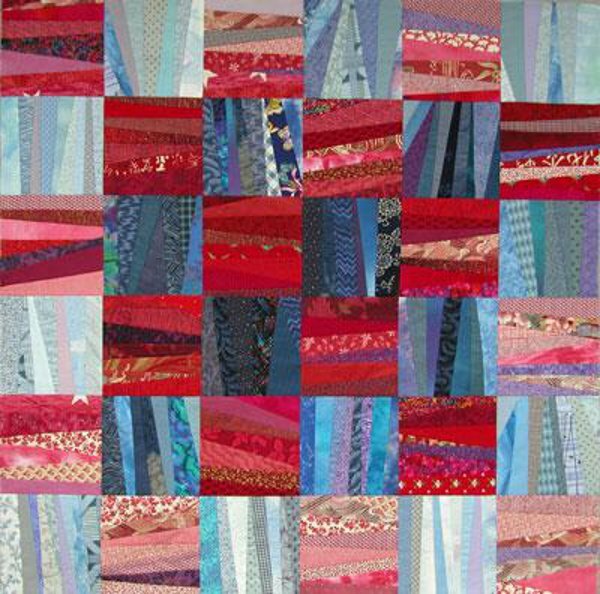 This quilt top is an excellent way to use up all the small scraps and strips that quilters seem to accumulate. Designed for the quilter that loves decorative quilting designs. It is easy enough for a beginner, but can be interesting for a more experienced quilter as no two blocks turn out the same. It's fun. Shown on Ann's segment of "Simply Quilts." View the completed project. This 36 x 36 inch quilt top is fun and easy to make. You'll feel very creative as every block turns out different than the one before. It's fun to see how different colors and prints work together. A wide selection of fabric strips is necessary to complete this piece. You may use scraps, strips and even left over pieces of bias binding to create the blocks. A lightweight foundation of nonwoven sew-in interfacing remains under the block and provides a stable backing for the finished quilt top. Once you make the first block you will see the potential for an unlimited number of variations and settings. What a wonderful way to use up those little pieces of fabric you've been saving! This pattern was the basis for Ann's appearance on episode #621 of "Simply Quilts." This pattern is appropriate for all levels of quilters; beginner to advanced. View the completed project.